Enjoy low maintenance, trouble-free printing. HP Smart technology in the toner cartridge and your printer makes HP supplies easy to install and maintain. Receive automatic alerts when a cartridge is low or out. Enjoy convenient, on-line ordering. 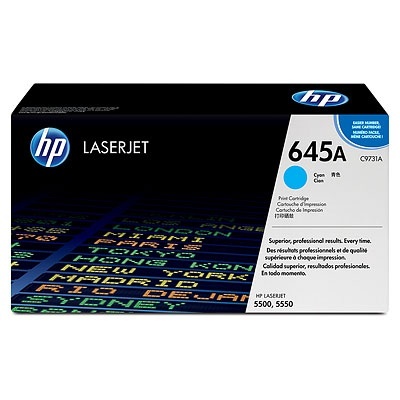 Save time with all-in-one HP 645A LaserJet supplies. HP Smart technology makes automatic adjustments to optimize print quality and enhance reliability. Minimal user intervention saves time, improves productivity and lowers overall printing costs. Accurate color, precise image reproduction and crisp, sharp text every time you print. Chemically-grown toner and HP Smart printing system technology deliver consistent results and reliable performance throughout the life of the cartridge.